One of the most popular master classes that we run is Building Confidence as a Therapist. We have been running this course now for 8 years. 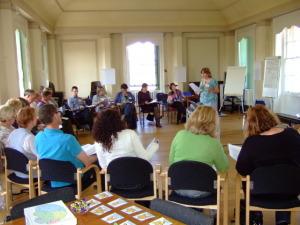 The aim of this master class is to give human givens practitioners who have completed the Diploma in human givens psychotherapy but have not yet submitted video sessions of their work in order to become full members of the human givens institute the confidence to submit videos which clearly demonstrate that they are a safe and effective human givens practitioner. Some practitioners want to benefit from a refresher course, require clarification of exactly what is required or want to boost their confidence. Occasionally “life gets in the way” and the gap between getting your Diploma and submitting your videos grows unexpectedly. Whatever the reason, this master class is designed to help you regain the momentum to successfully achieve your full human givens accreditation. Confidence in your ability to submit videos of your work which clearly demonstrate that you are a safe an effective human givens practitioner. Practical advice on how to implement each of the steps of RIGAAR in your therapy sessions. Tips and advice on the practicalities of creating videos and accompanying case notes which are suitable for submission and successful assessment. Guidelines on what to do and what to avoid when filming therapy sessions for your video submission. Knowledge of what to include and what to leave out when submitting concise and appropriate case notes. The valuable experience of watching one or more videos of previously successful video submissions by other therapists. Confidence in using outcome measures without losing rapport with your client. Practical approaches for seamlessly integrating story and metaphor into your therapy work. A refresher on the effective and appropriate use of therapeutic language skills. Awareness of how to avoid mistakes commonly made by newly qualified therapists. 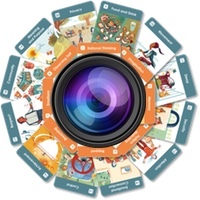 Techniques (including using in8 cards) to raise the profile of your HG practice in your local area and target market. 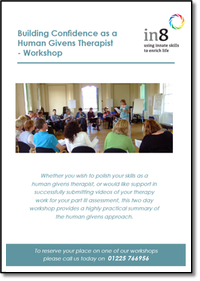 The master class is also suitable for anyone who qualified some time ago and feels that they would benefit from a refresher course in practical aspects of applying the human givens approach in therapy. Click here to download the brochure for this workshop. If you would like to be notified when future Building Confidence as a Therapist master classes are being help please contact us and we will inform you of future dates and locations.